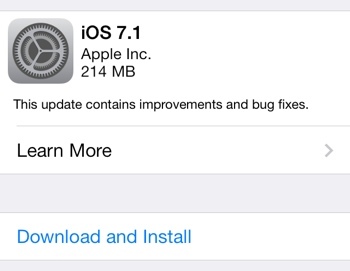 Today, Apple has released iOS 7.1, a free update to its iPhone, iPad and iPod touch operating system that delivers bug fixes and a handful of welcome design changes. The new iOS 7.1 enables Apple CarPlay, the new name for iOS in the Car, an app designed to interface directly with the in-dash display soon-to-be-available in many 2014 model year vehicles. There are security updates and “user interface refinements” as well – you’ll immediately notice small changes that make certain buttons easier to see and touch. iOS 7.1 brings an update to Siri, Apple’s digital personal assistant. Now, you can control Siri by holding down your device’s home button while you speak. Releasing the button will signal to Siri that you’re done talking. It’s a different method than you’re used to (the old method still works), but it makes Siri’s operation more intuitive and faster. To update your device to iOS 7.1, connect it to a power source and WiFi network. Open the Settings app, then tap General > Software Update > Download and Install. Agree to the terms, and allow it to restart when needed.